The university requires all students to register for classes and to complete payment of all tuition, fees, and charges for the upcoming academic semester no later than the last day of the designated payment period in the academic calendar. A tuition payment installment plan operated by Higher One enables students to pay all or part of the semester’s tuition and fees in installments without interest charges. The Higher One Tuition Payment Plan may be used to supplement other forms of scholarships, grants or loans. A valuable feature of the tuition payment plan is tuition payment insurance, which is provided at no charge and guarantees payment of the contract balance to the school in the event of the insured person’s death. Participation in the payment plan is on a semester-by-semester basis. Under the Higher One Tuition Payment Plan, the cost of tuition for fall semester may be divided into five equal monthly installments for students who enroll by June 1. The number of permitted monthly installments decreases between June 1 and October 15. Payments to the fall pay plan must be concluded by October 15 for spring enrollment eligibility. The five equal installments for the spring plan begin October 15 and run through March 15. The fee for tuition plan enrollment is $35 per semester, which is non-refundable. A $20 late fee is incurred when a payment does not reach the Higher One Tuition Payment Plan office by the 15th of each month. Please note: The Higher One Tuition Payment Plan does not cover prior balances or summer semesters. The University Payment Plan is also available, with automatic enrollment when at least half of the current semester charges are paid before the end of the regular registration and payment period. This plan allows students to make two additional payments to cover the remaining 50 percent account balance. Financial aid deferments, verifiable third-party promises or other methods of payment can be used to cover the initial one-half payment. There is a $25 administrative charge to all accounts on the university’s payment plan. The additional payment dates are Sept. 1 and Oct. 1 for the fall semester and Feb. 1 and March 1 for the spring semester. A $20 late fee is incurred when payments are late under the University Payment Plan. Students who are not be able to pay the full amount for a semester or summer session should secure assistance in advance to avoid delays in registering or payment of bills when due. Students who fail to register and make payments according to the deadlines listed in the Academic Calendar will be charged a $50 late registration fee. The Board of Governors of the University of North Carolina reserves the right to amend the charges for tuition, fees, and the room-and-board rate at any time without prior notice. The university requires all students who are continuing their enrollment from the previous semester to register for classes and to complete payment of all tuition, fees and charges for the upcoming academic semester by the last day of the designated payment period. Students who do not meet the payment deadline will have their classes cancelled and must re-register during the late-registration period and pay a $50 late-registration charge. This could result in forfeiture of classes on the student’s previous schedule if individual classes are closed. Students are expected to pay their bills paid in full before the first day of classes or by the designated payment period. Students who receive financial aid are expected to pay any portion of their bill not covered by financial aid before the first day of classes. Students whose bills are not paid in full by the first day of classes or who have not made payment arrangements by that time will be charged a late-registration fee. Payments may be made by money orders, cashier’s checks, or personal checks designed as payable to “North Carolina Central University.” The student’s Banner Identification Number should be indicated on money orders and checks to ensure credit is given to the correct account. MasterCard and VISA are also accepted. Payments may be made in advance, in person, by mail, or on-line using a credit card. Payments should be received by the Cashier’s Office no later than the last day of the designated payment period in order for a student to retain his or her current classes. It is the student’s responsibility to verify receipt of payments made to the Cashier’s Office by calling the office, visiting in person, or checking with their own bank for check clearance. Student grades, transcripts, degrees, and diplomas may be withheld until all financial obligations to the university, other than student loans, are paid in full. North Carolina State law requires that all previously incurred expenses and accounts at North Carolina Central University must be paid in full prior to pre-registration or registration for a new term. Delinquent student accounts will be turned over to the State Attorney General’s Office and to a collection agency. A student is not officially registered in any classes until all tuition and fees are paid for the semester. Enrollment may be dropped for the semester if all tuition and fees have not been paid by the payment deadline for the semester. Students who are dropped from classes for non-payment will not be allowed to re-enroll in classes until the following semester. Post-baccalaureate students not in an advanced-degree program will be charged at the graduate rate unless they are seeking a second baccalaureate degree. Auditing a Course - charges are the same as for taking a course for credit. *Graduation fees are charged every term in which a student applies for graduation. If a student fails to graduate during that term, no adjustment is made to the student’s account. The student must apply again for graduation during the term he/she expects to complete all work, and another Graduation fee will be charged. Diplomas are ordered any time a student applies for graduation. If the student does not meet the requirements for graduation, the diploma is invalid. Fees are charged by Student Health Services for medical treatments/procedures available to students on an as-needed basis. A listing is available from Student Health Services. All undergraduates who carry 12 or more hours, and graduate and law students who carry nine or more hours, must pay full tuition and fees. Students who carry less than the full-time load must pay the following tuition and fees per semester. North Carolina Central University is a publicly supported institution. Tuition payments and other required student fees meet only part of the total cost of the education of enrolled students. The State of North Carolina appropriates an average of $13,933 per year per student in public funds to help support the higher education programs offered. The university has the capacity to house approximately 2,800 students. Dining facilities are available for use by all students. The rate for residence halls ranges from $2,400.00 to $4,100.00 per semester. A limited number of apartments with cooking facilities also are available. Single-rooms in Eagle Landing apartments are $3,750.00 per semester in the three-bedroom units and $3,600.00 per semester in the four-bedroom units. Fees for Martha Street apartments - which house graduate students, law students and non-traditional students - are $3,800.00 for two-bedroom, two-bath units and $3,900.00 for two-bedroom, one-bath units. A one-bedroom, one bath Martha Street unit is $4,100.00 per semester. Undergraduate students who live in residence halls are required to purchase meal plans for dining services on campus. NCCU Dining Services managers will work with students who have dietary problems in planning meals. A variety of student meal plans are available through Dining Services. Students classified as freshmen who are living on campus are required to sign up for a plan providing 21 meals per week. The cost for this plan, which includes $225 in flexible spending funds, is $1,875.87 per semester. Upper-level students have a choice of two plans providing 14 meals per week: a 14-meal plan with $300 flex dollars that costs $1,727.32 and a 14-meal plan with $225 flex dollars that costs $1,655.92 per semester. An eight-meal plan that includes $375 flex dollars is available to students living in Eagle Landing at a cost of $1,460.17 per semester. Commuter Plans are offered to students living off-campus. Commuter Plan 50 consists of 50 meals at a cost of $309.77; Commuter Plan 75 consists of 75 meals at a cost of $458.32; and Commuter Plan 100 consists of 100 meals with $110 flex dollars and costs $643.72. New students who plan to live in a residence hall must submit an application for room and board, along with a $150 non-refundable housing administrative fee, by May 1 to be considered for a one-year residency beginning in the fall semester. For spring semester residence, the $150 non-refundable administrative fee must be submitted by December 1. The housing contract is binding if the student enrolls in the university. Residence hall reservations should be made as early as possible. Returning students may submit their $150 administrative fee as early as on Nov. 1 of the fall semester, which will allow them to participate in the online housing process for the following year. The online housing process will remain open to returning students until all designated returning spaces have been filled. The university’s Board of Trustees can change the room and board rates or the housing administrative fee at any time without prior notice. For additional information, please contact 919.530.6227 or email residential_life@nccu.edu. Mail for students living on campus is delivered to a private, key-locked mailbox located in the Student Union Building. The annual mailbox rental fee is $30; $8 for the summer session. Health and accident insurance is mandatory for all students taking six or more credit hours of classes on campus. The UNC Board of Governor’s requires that all students in the UNC system purchase a policy through its statewide plan or provide proof of credible independent coverage. Insurance is offered by the university system for a 12-month period that begins August 1. The cost is subject to change each year. The student insurance policy, Student Blue, is underwritten by Blue Cross Blue Shield of North Carolina. For more information concerning benefits, participating providers, vision and more visit www.studentbluenc.com. Distance education students and students taking fewer than 6 credit hours of classes will not be charged the sickness and accident insurance fee. Students who have their own insurance can waive the university-sponsored insurance plan. To do this visit www.studentbluenc.com and follow the instructions. The deadline for submitting an on-line student insurance waiver for fall 2017 is Sept. 11. Students who have not submitted an insurance waiver by the deadline date will be automatically enrolled in the student insurance plan. A new waiver must be submitted each academic year. Parking on campus is by permit only. All students who park on campus are required by North Carolina Central University to register their vehicle with the University Police Department. After paying the registration fee, the decal holder should permanently display the valid permit on their vehicle. Students’ hangtags must be placed on the rearview mirror facing outward at all time while parked on campus. Parking on campus is zoned parking. An NCCU parking permit authorizes the vehicle to be parked in a specific area according to the permit designation. Open parking on campus is for visitors only. Registration forms are available on NCCU’s website. Students may park in the assigned designated lots only with the proper decal. No parking decal refunds will be granted. All parking decal purchases are final. NCCU faculty, staff, students and visitors are encouraged to take advantage of the free Maroon and Gray shuttle service offered through NCCU Student Services. The campus shuttle buses (known as the Maroon and Gray lines) depart every 15 minutes from 7 a.m. to 7 p.m. Monday through Friday from the Latham Parking Deck. The lines transport passengers to major points on campus. Schedules are available in the NCCU Police Department. Each application for a admission to the University must be accompanied by a non-refundable deposit of $50. Students must officially withdraw from the university to receive an adjustment of tuition and fees. If a student officially drops all classes prior to the end of the official drop/-add, late-registration period, all tuition and other fee charges will be adjusted. If a student officially withdraws after the end of the official drop/add, late-registration period, the student’s bill will be reduced on a prorated basis. From the end of the official drop/add period until two weeks after the end of the drop/add period, 40 percent of tuition and fees will be adjusted. From two weeks after the end of the official drop/add period until four weeks after the end of the drop/add period, 20 percent of tuition and fees will be adjusted. Tuition and fees are not adjusted after four weeks from the close of the official drop/add period. If a student has received financial aid (other than College Work Study) and officially withdraws from the university during the academic term, a refund of a portion of the aid to the Title IV programs may be required or the student may need to repay a portion of the award funds received by the university. A full-time student whose enrollment drops below the course load required for full-time status, or a part-time student who drops courses, will have charges for tuition and fees reduced accordingly, provided the courses are dropped prior to the end of the official drop/add period. Financial aid awards also will be adjusted accordingly. A student must carry 12 credit hours each semester of the academic year and at least six credit hours during summer sessions to qualify for financial aid. Undergraduate students with loans must be enrolled in at least six credit hours to receive a refund from their loan proceeds each semester, and graduate students with loans must be enrolled in at least 4.5 credit hours to receive a refund from their loan proceeds each semester. No adjustments will be made for courses dropped after the end of the official drop/add period. Daily charges are calculated by dividing the number of days (check-in through last day of exams) per semester by the room cost. Buyout exception for category E: A student may find another student (not a current resident) to buy out the remainder of the agreement. The student must meet all eligibility requirements to live on campus. Both students must contact the Residential Life office to process the buyout option. Students evicted from Residential Life will be responsible for payment of the entire semester’s room rent. Registered students who cancel between April 1 and the first day of check-in will pay 50 percent of the price of the full term. Withdrawing from the university: Students will be charged the daily rate calculated using the date of checkout from the residence hall. A $100 charge will apply for students who cancel or do not move into the residence halls as per the agreement. Fifty percent of the remaining session cost plus daily charges will be assessed to students moving off campus during the session. Non-registered students will pay $100 plus daily charges. Financial aid deferments are not considered as payments but are used as temporary credits for registration processing. As a general policy, refund processing will take place on Monday of each week, and refunds will be mailed or directly deposited into the student’s requested bank account on Friday of each week, unless otherwise published. If a student does not have an active student direct-deposit account on file, the student must update local address online prior to the refund processing date. Students who add one or more classes after receiving a refund check will be charged additional tuition and fees for the added class(es). Students who drop one or more classes after receiving their refund check will owe money to the university if their financial aid award is reduced due to a lesser course load. Undergraduate students with loans must be enrolled in at least six credit hours to receive a refund from their loan awards. Graduate and law students with loans must be enrolled in at least four-and-one-half credit hours to receive a refund from their loan proceeds. Undergraduate students who are enrolled in less than six credit hours and who have an overpayment on their account will receive refunds at the end of the semester in which the credit occurred. All refunds of overpayments will be mailed to the local address on record or deposited into the active direct-deposit account on file. Overpayments made by credit card will not be refunded to the card. Graduate and law students enrolled in less than four and one half credit hours and who have an overpayment on their account will receive refunds at the end of the semester in which the credit occurred. Overpayments caused by credit card payments will not be credited back to a credit card. All refunds of overpayments will be mailed to the local address on record or deposited into the active direct deposit account on file. Students who are enrolled full time and overpaid their accounts using personal checks will receive a refund within two weeks. Students whose checks are returned because of insufficient funds will be charged a $25 insufficient funds fee. 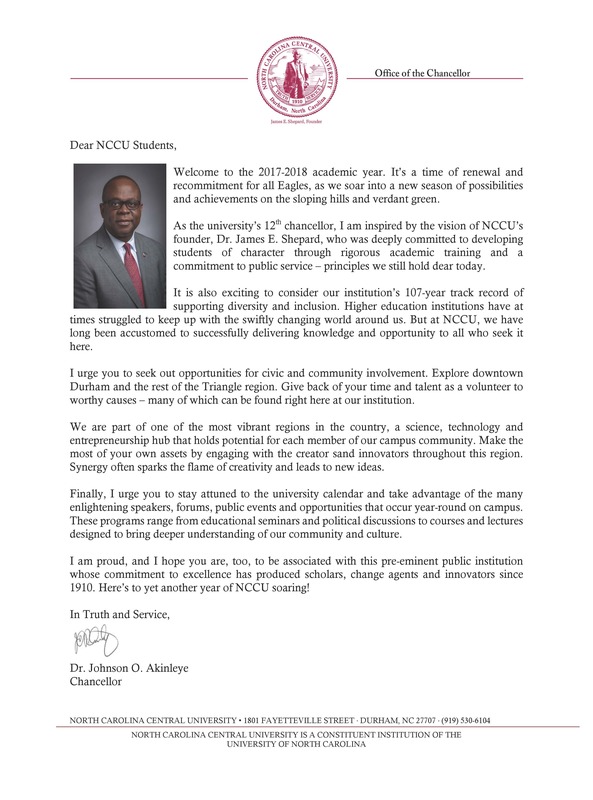 In addition, NCCU will not accept additional personal checks of any type for the duration of the student’s enrollment at NCCU. Individuals who not enrolled and have credit balances with the university will receive refunds at the end of the semester in which the credit occurred. Credit card payments will not be refunded to the credit card. All refunds will be deposited to the active direct-deposit account on file. Students should verify that charges for room and board have been deducted from their accounts before spending a refund check. It is the student’s responsibility to ensure that room and board charges are paid. Please note: Students in the Executive Masters of Public Administration Program (EMPA Program) cannot use the faculty and staff tuition waiver to pay for any courses in this program. The Student Accounting Office hours are from 8 a.m. to 5 p.m., Monday through Friday. The telephone number is (919) 530-5071. A student shall be financially responsible for damage he or she does to any building, equipment or other property of the institution. If it cannot be determined which student is responsible for the damage, the cost of the damage will be distributed equally among the group of students using the facilities at the time of the damage. If this cannot be determined, the cost of the damage will be charged against the entire student body. A one-time $50 damage fee (included in the deposit fee) is due at the time the student moves into the residence hall. To qualify as a resident for tuition purposes, a person must establish legal residency and remain a legal resident for at least 12 months immediately prior to classification. Thus, there is a distinction between legal residence and residence for tuition purposes. The burden is on the applicant to establish those facts that justify classification of a student as a resident entitled to in-state tuition rates. To attain such classification, the applicant must show his or her entitlement by the preponderance (the greater part) of the residency information. Being classified a resident for tuition purposes is contingent on the student seeking such status and providing all information that the institution may require in making the determination. As such, students must apply for North Carolina In-state Residency for Tuition Purposes by completing the required application and providing all documentation requested. Applications to qualify for North Carolina Residence Status for Tuition Purposes must be received 30 days before the first day of classes of the proposed term of enrollment. Applications received after this date may be considered for a subsequent term. If an applicant, irrespective of age, has living parents or a court-appointed guardian, the residence of the parents or guardian is considered to be the domicile of the individual. However, this prima facie evidence may or may not be sustained by other information. Further, parents’ or guardians’ legal residency is not deemed prima facie evidence of the applicant’s status if the applicant has lived (though not necessarily legally resided) in North Carolina for the five years preceding enrollment registration. Marriage alone does not prevent a person from becoming or continuing to be a resident for tuition purposes, nor does marriage in any circumstance ensure that a person will become or continue to be a resident for tuition purposes. Marriage and the legal residence of one’s spouse are, however, relevant information in determining eligibility. Furthermore, if both marital partners are legal residents of North Carolina and if one of them has been a legal resident longer than the other, then the longer duration may be claimed by either spouse in meeting the 12-month requirement for in-state tuition status. A North Carolinian who serves outside the state in the armed forces does not lose North Carolina residency simply by reason of such service. Students from the military may prove residency, as do other students, with evidence related to residential activity and intent. In addition, a separate North Carolina statute affords tuition-rate benefits to certain military personnel and their dependents in some cases where the individual does not qualify for the in-state tuition rate by residing for 12 months in North Carolina. Members of the armed services, while stationed and living in North Carolina, may be charged a tuition rate that is lower than the out-of-state tuition based on federal tuition-payment eligibility and other factors. A dependent relative of a service member stationed in North Carolina is eligible for in-state tuition rates while living in North Carolina with the service member so long as he or she has met any applicable requirement of the Selective Service System. These tuition benefits may be applied only if the applicable requirements for admission have been met. If a person (1) has been a bona fide legal resident of the required duration, (2) has consequently been classified a resident for tuition purposes, and (3) has subsequently lost North Carolina legal residence while enrolled at a public institution of higher education, that person may continue to enjoy the in-state tuition rate for a grace period of 12 months, measured from the date on which North Carolina legal residence was lost. If the 12-month period ends during an academic term for which the person is enrolled at a state institution of higher education, the grace period extends to the end of that term. The fact of marriage to someone who continues living outside of North Carolina does not by itself cause loss of legal residence marking the beginning of the grace period. Minors (persons under 18 years of age) usually have the same domicile as their parents, but certain special cases are recognized in determining residence for tuition purposes. If a minor has lived for five or more consecutive years with relatives (other than parents) who are domiciled in North Carolina, and if the relatives have functioned during this time as if they were personal guardians, the minor will be deemed a resident for tuition purposes for an enrolled term commencing immediately after at least five years in which these circumstances have existed. If under this consideration a minor is deemed to be a resident for tuition purposes immediately prior to his or her 18th birthday, that person upon achieving maturity will be deemed a legal resident of North Carolina of at least 12 months duration. This provision acts to confer in-state tuition status even in the face of other provisions of law to the contrary. However, a person deemed a resident of 12 months duration pursuant to this provision continues to be a legal resident of the state only so long as he or she does not abandon North Carolina domicile. If a student ceases enrollment at or graduates from an institution of higher education while classified a resident for tuition purposes and then both abandons and reacquires North Carolina domicile within a 12-month period, that person, if he or she continues to maintain the re-acquired domicile into re-enrollment at an institution of higher education, may re-enroll at the in-state tuition rate without having to meet the usual 12-month durational requirement. However, any one person may receive the benefit of the provision only once. A student admitted to initial enrollment in an institution (or permitted to re-enroll following an absence from the institutional program which involved a formal withdrawal from enrollment) must be classified by the admitting institution either as a resident or as a nonresident for tuition purposes prior to the actual enrollment. A residence status classification once assigned (and finalized pursuant to any appeal properly taken) may be changed only at intervals corresponding with the established primary divisions of the academic year. When a student transfers from one North Carolina public institution of higher education to another, he or she is treated as a new student by the incoming institution and must be assigned residence status classification for tuition purposes. The initial classification of students as in-state or out-of-state students for tuition purposes is made at the time the student’s application for admission is processed. Appeals for in-state status must be made to the university registrar before the first day of classes for the term for which in-state status is sought. The appeals form can be obtained from the Registrar’s Office. A student who does not appeal before the first day of classes for the term must pay the out-of-state tuition; however, a refund for the difference between out-of-state tuition and in-state tuition will be given if the appeal is approved. An appeal of the registrar’s decision of the University Registrar must be made in writing to the chancellor within 15 days of the decision of the University Registrar, if such an appeal is desired. University regulations governing residential classification of students are set forth in detail in “A Manual to Assist the Public Higher Education Institutions of North Carolina in the Matter of Student Residence Classification for Tuition Purposes.” Each enrolled student is responsible for knowing the contents of this manual. A copy of this manual is available for inspection upon request in the Reserve Department of the James E. Shepard Library. Since the summer school program is self-supporting, tuition and fees are adjusted annually. Students should consult the Summer School Bulletin for the exact tuition and fees for the summer session they plan to attend. For information, students may visit the Summer School Office on the third floor of the School of Education Building, or they may write to: Summer School Office, North Carolina Central University, Durham, NC 27707. Also, additional information on Summer School admissions, housing, financial aid, meals, parking, health services, academic regulations, and cancellation of courses can be found in this catalog under “Academic Programs and Institutes” section. Refunds will be processed as scheduled by the Summer Refund Schedule. Refunds will be made only to students who officially withdraw by the deadline date listed in the summer school calendar. Refunds will not be made to students who unofficially withdraw by not attending classes or who are dismissed for disciplinary reasons. Refunds for reduced loads are not given unless courses are canceled or unless the student reduces his/her load by dropping a class or classes on the date designated in the Academic Calendar as the first day of classes.